Companies in the eye health supplements market are mainly focusing on product line extensions, novel packaging, formulation technologies and clinical validation of their products to gain health claims. Furthermore, these companies are actively involved in geographic expansion and acquisition of other companies to acquire a larger market share. Companies are actively promoting their products through various information sources such as TV ads, social media and other platforms to increase consumer awareness about eye health conditions. Persistence Market Research in its newly published report – “Eye Health Supplements Market: Global Industry Analysis and Forecast, 2016–2024,” has targeted geographies where the analysts have observed that presently, North America, Europe and Asia Pacific regions are target markets for major players in the global eye health supplements market. Moreover, increase in consumption of dietary supplements, the rise in healthcare expenditure and a large population suffering from eye disorders are factors prompting investors to invest in these regions. The analysts have observed that the key players are focusing on strengthening their market position by acquiring other firms and launching their products across different regions. Moreover, companies are targeting people over 50 years of age in North America and Europe. Few companies are also adopting different distribution channels to reach more consumers. This report covers the global eye health supplement market performance in terms of revenue contribution from various segments. This section also includes Persistence Market Research’s analysis of key trends, drivers, restraints and opportunities, which are influencing the growth of the global eye health supplements market. The primary objective of the report is to offer updates and information related to market opportunities in the global eye health supplements market. The report provides an overview of the global eye health supplements market along with a comprehensive market forecast. This report covers the global eye health supplements market performance in revenue contribution from various segments. This section also includes Persistence Market Research’s analysis of key trends, drivers, restraints and opportunities, which are influencing the growth of the global eye health supplements market. Impact analysis of key regional growth drivers and restraints based on the weighted average model along with key region-specific trends is included in the report to provide useful information and hidden insights. Persistence Market Research also provides key strategic recommendations for both existing and new players in the market to emerge sustainably profitable. 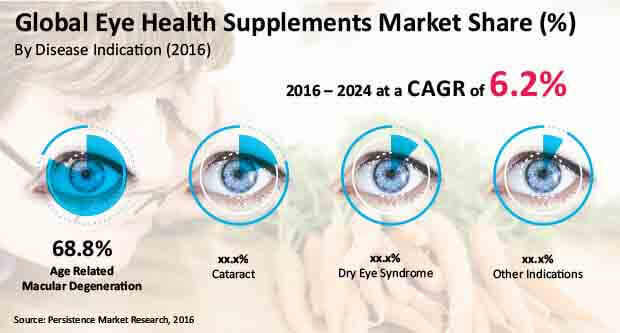 In the final section of the report, the global eye health supplements market landscape is included to provide report audiences with a dashboard view on the basis of categories of providers across the market, their presence in the global eye health supplements market and key differentiators. The forecast presented in this report assesses the total revenue of the global eye health supplements market. When developing the market forecast, the starting point involves sizing the current market, which forms the basis of how the market is anticipated to take shape in the near future. Yearly change in inflation rate has not been considered while forecasting market numbers. Top-down approach has been used to calculate the market sizing, while bottom-up approach by therapeutic areas has been used to counter-validate the numbers in the global eye health supplements market. Indicators such as R&D expenditure, research funding from government and non-profit organizations, etc. have been considered to arrive at the indicated market numbers. The report also takes into consideration year-on-year growth to understand the predictability of the market and to identify the right opportunities across the global eye health supplements market. As previously highlighted, the market for eye health supplements is split into various categories. All these segments have been analyzed in terms of basis point share to understand individual segments’ relative contribution to market growth. This detailed level of information is important for the identification of various key trends in the global eye health supplements market. By disease indication, the age-related macular degeneration segment was estimated to reach close to 70% revenue share in the global eye health supplements market by 2016 end and is expected to gain over 100 BPS in market share by 2024 over 2016. The age-related macular degeneration segment is expected to create absolute $ opportunity of more than US$ 70 Mn in 2017 over 2016. By the end of 2024, this segment is projected to be valued close to US$ 2000 Mn, expanding at a CAGR of 6.5% over the forecast period. Age-related macular degeneration segment revenue in the global eye health supplements market is expected to expand 1.7x by 2024 end as compared to that in 2016. This segment dominated the global eye health supplements market in terms of revenue in 2015 and the trend is projected to continue throughout the forecast period. Age-related macular degeneration segment is the most attractive segment in the global eye health supplements market, recording an attractiveness index of 2.9 over the forecast period. According to a research study conducted by the National University of Singapore and National University Health System in January 2014, age-related macular degeneration ranks as the third leading cause of blindness after cataract and glaucoma. Furthermore, globally 196 Mn individuals are likely to suffer from age-related macular degeneration by 2020 which is expected to touch 288 Mn by 2040. The increase in consumer awareness about preventive health and the need to consume health supplements is driving the growth of the global eye health supplements market. These days, consumers are relying on alternate channels that can help them diagnose and treat various conditions. About 70% of Americans currently rely on the internet to understand their condition and make decisions regarding treatment. In this fast moving world, consumers are more focused on their health due to the changes in their dietary habits. Many consumers are getting healthcare related information through various magazines, the internet, TV ad campaigns and articles. These information sources provide in-depth information about dietary supplements and new product offerings by various companies. This barrage of information from various sources is fueling consumer purchasing decisions. Based on consumer interests, companies are launching different types of dietary supplements in the market. This factor is creating a positive impact on the global eye health supplements market. Companies are adopting different distribution channels to increase the sales of their products and to widen consumer outreach. A large part of the sales of vitamin and mineral supplements are through super/hypermarkets, pharmacy stores and retail stores. However, e-commerce sales have grown significantly over the last 5 years and this trend is expected to continue owing to increase in internet penetration and convenience of online shopping. Many eye health product manufacturers are adopting different distribution channels by collaborating with hypermarkets and e-commerce stores to increase their product reach to consumers. This is also propelling segmental revenue growth of the global eye health supplements market. Age-related macular degeneration disease indication is likely to witness high CAGR during the forecast period in North America. In terms of value, the age-related macular degeneration segment is expected to reach more than US$ 400 Mn in 2017. This growth trend is projected to continue throughout the forecast period. In Latin America, the segment is the most attractive with an attractiveness index of 2.5 over the forecast period. High prevalence of age-related macular degeneration in the U.K. is likely to create significant growth opportunities for eye health supplements providers in the region.